← That’s The Way To Do It! this season, in a Detroit area newspaper. 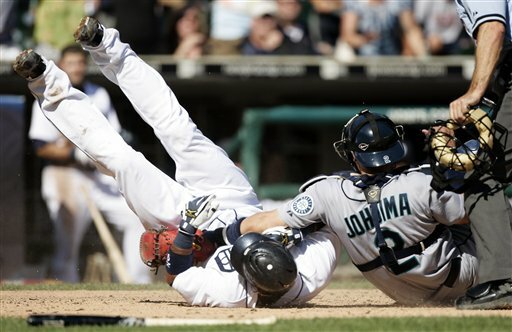 the Detroit Tigers (63-56) lost to the Seattle Mariners (62-58), 3-1.
hits. The American League strikeout leader (204) struck out 10 batters. Verlander deserved a win. He didn’t get it. performance of Tuesday’s win. I did. ninth that things began to heat up. Finally, after an unbelievable eight pitch at bat, Clete Thomas singled to right field, to score Cabrera, and win the game. Wow! hits. On the good side of things, his ERA still ranks in the top 10, among AL pitchers (3.18 ERA). starts since being traded, and has yet to pick up a win for the Tigers. be, especially as we play on the road. This entry was posted in Dailies and tagged Carlos Guillen, Clete Thomas, Jarrod Washburn, Jim Leyland, Justin Verlander, Magglio Ordonez, Ryan Raburn. Bookmark the permalink. Come from behind wins make us all feel good! Congrats!